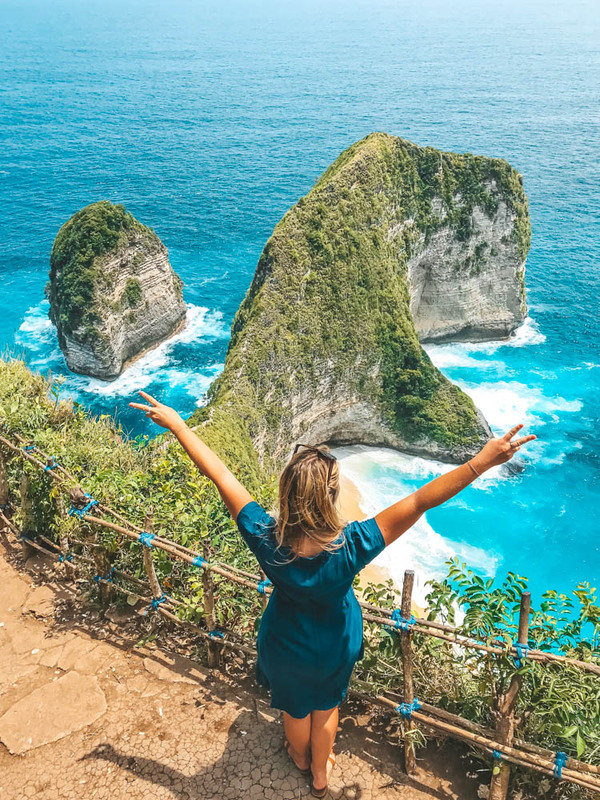 The most instagram hyped place in the world right now, at least what it feels like, is Nusa Penida, one of the three small islands just outside Bali, about 30 minutes by boat. 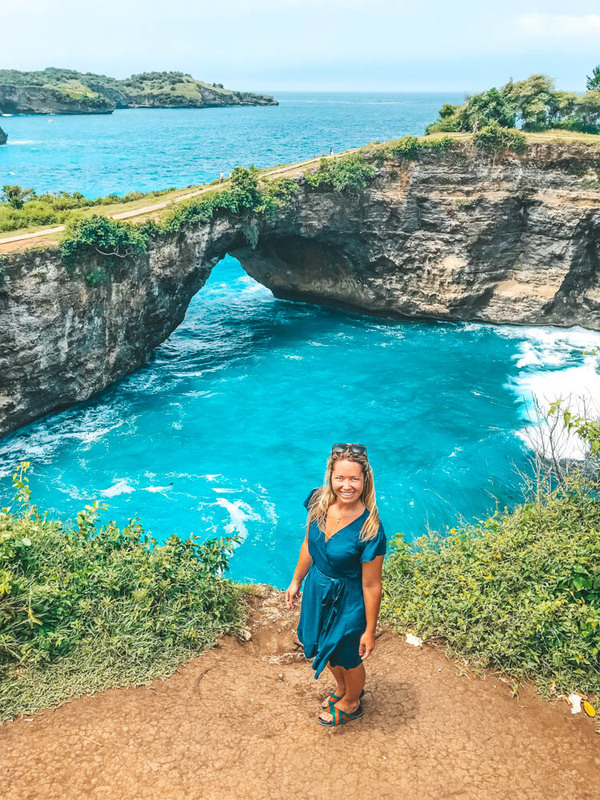 Nusa Penida is truly paradise and definitely one of the most beautiful places I’ve ever seen! 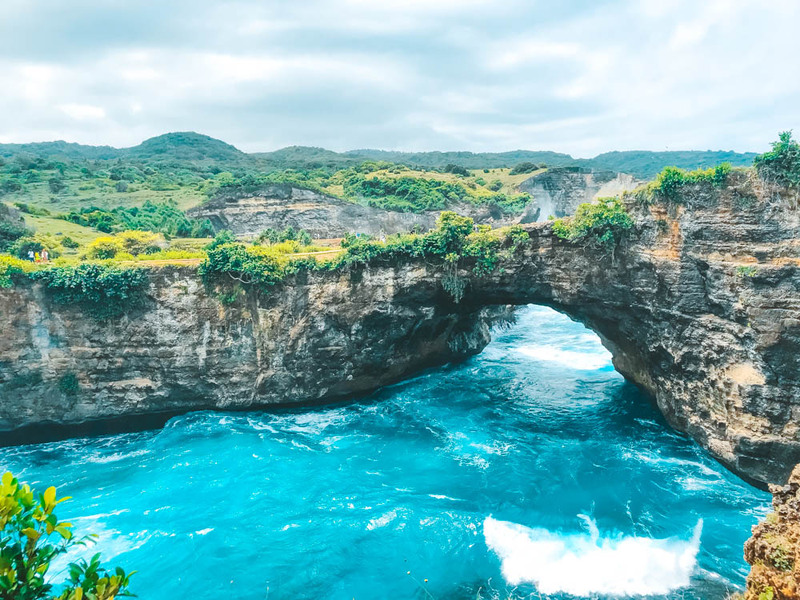 Going here on a day trip from Bali is a must if you are staying in Bali. 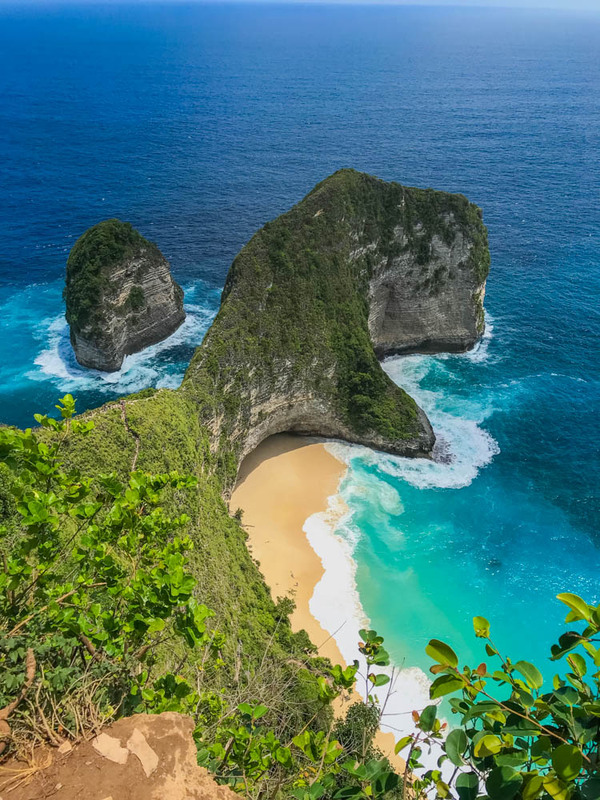 There are also some hotels here for those who want to stay overnight at Nusa Penida Island. 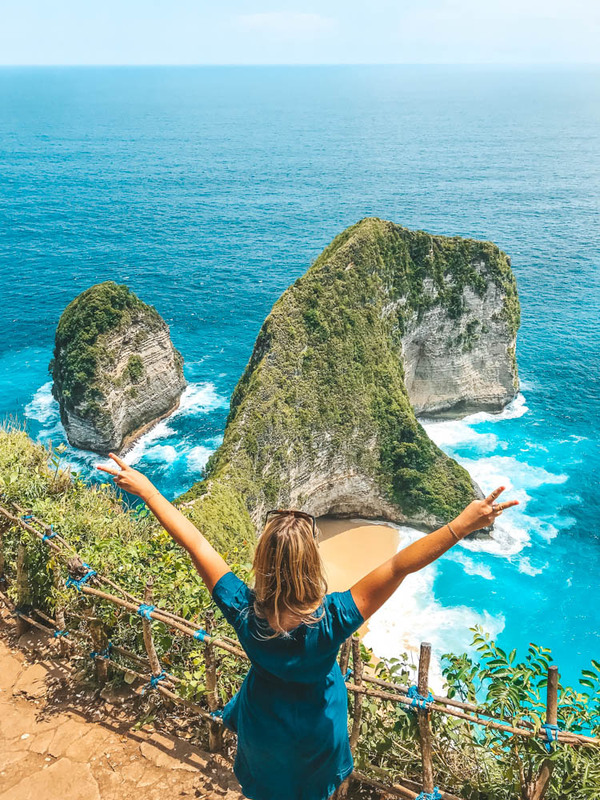 You can go to Nusa Penida on a day trip from Bali if you want and that can cost anything from 750,000 rupiah per person (about 50 Euro) and upwards depending on which company you travel with and what is included. (Usually lunch is included in these tours). Talk to various tourist kiosks on the streets in Bali and try to bargain the price. This is nothing that needs to be pre booked from home, it is possible to do it from one day to the other in Bali. 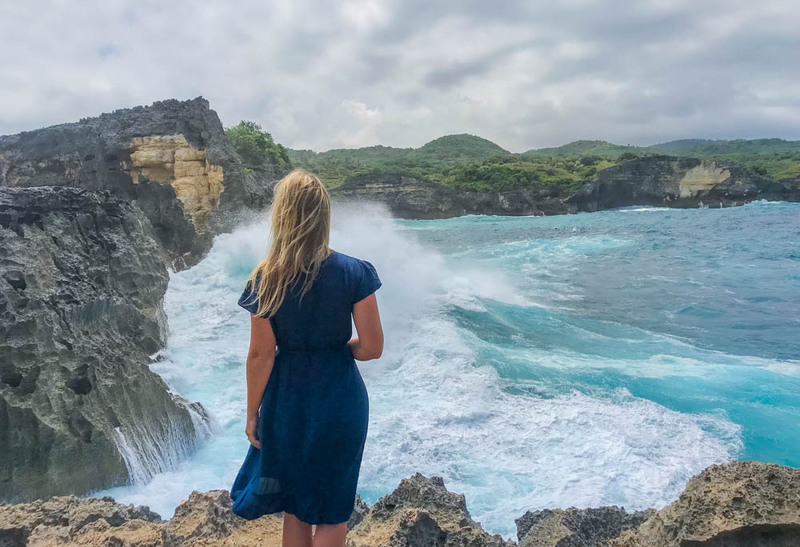 I went on a day trip to Nusa Penida from the island of Nusa Lembongan. 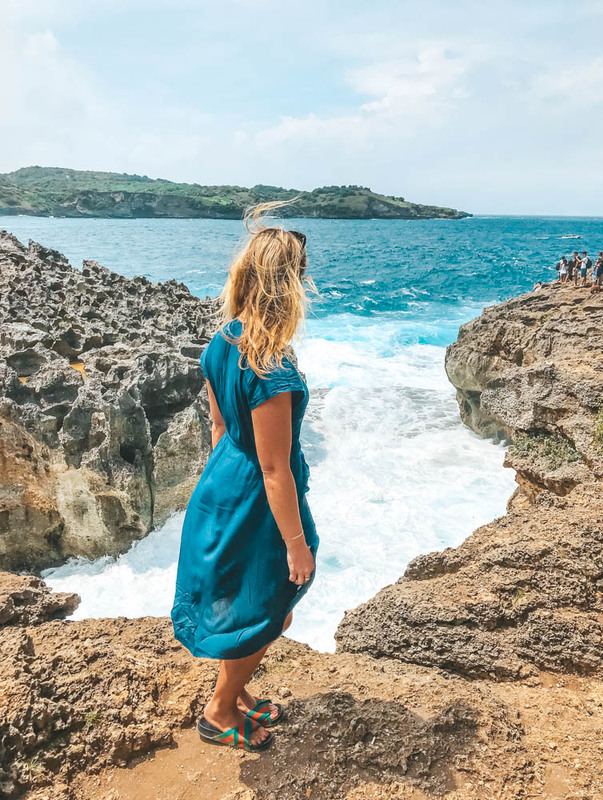 I bought a round trip boat ticket in the harbor where I came in by boat from Bali by a boat company that drove me back and forth from Lembongan to Penida. For that, I paid 300,000 rupiah (about 20 Euro) and the boat company was called Golden Queen, which suitably had a gold plated boat. 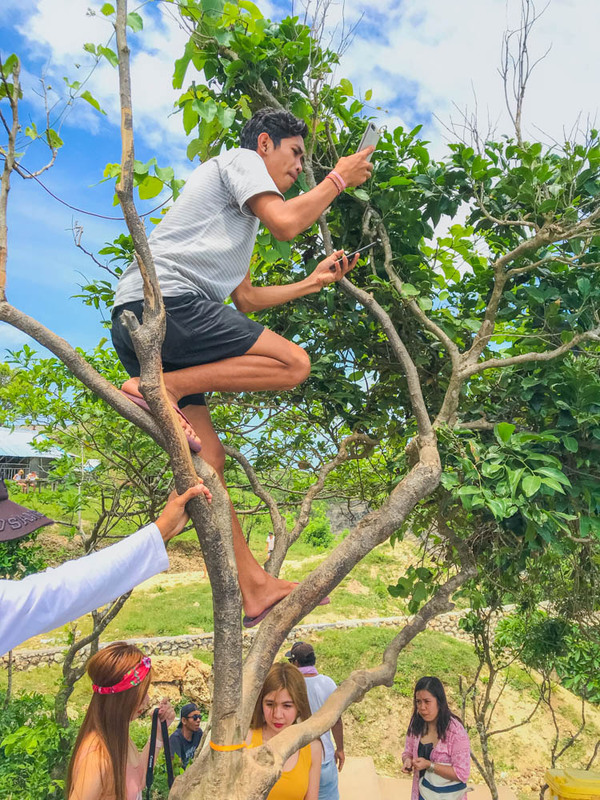 Once in place at Nusa Penida, the boat company I went with had arranged a private guide for me which I paid another 500,000 rupiah for (about 30 Euro). 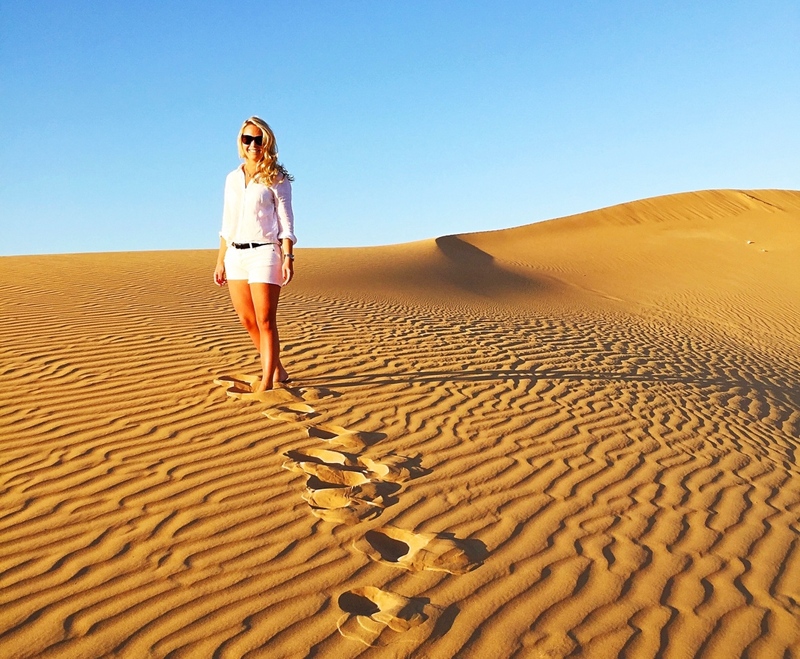 Then I got both a driver and a private guide, who also had to act as a photographer for me. I had my own big van that he was driving around in and we had agreed on what I wanted to see on the island, then he had to decide which order we would take them in. 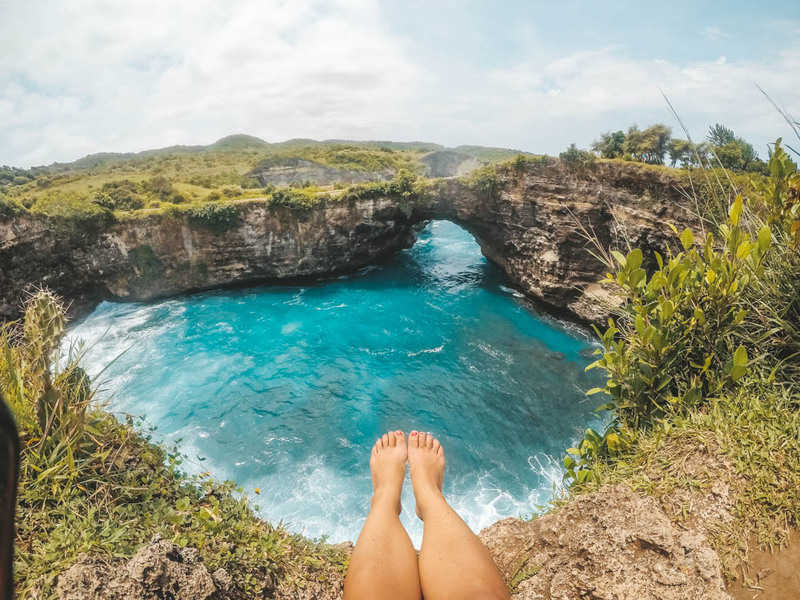 Angel’s Billabong is a natural sea pool. 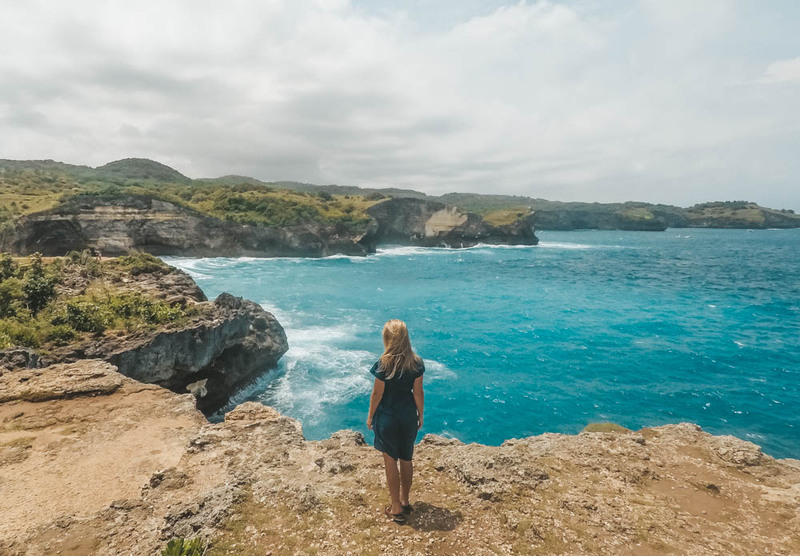 Here you can swim when it is low tide between the sea cliffs and this is a popular tourist attraction on Nusa Penida. 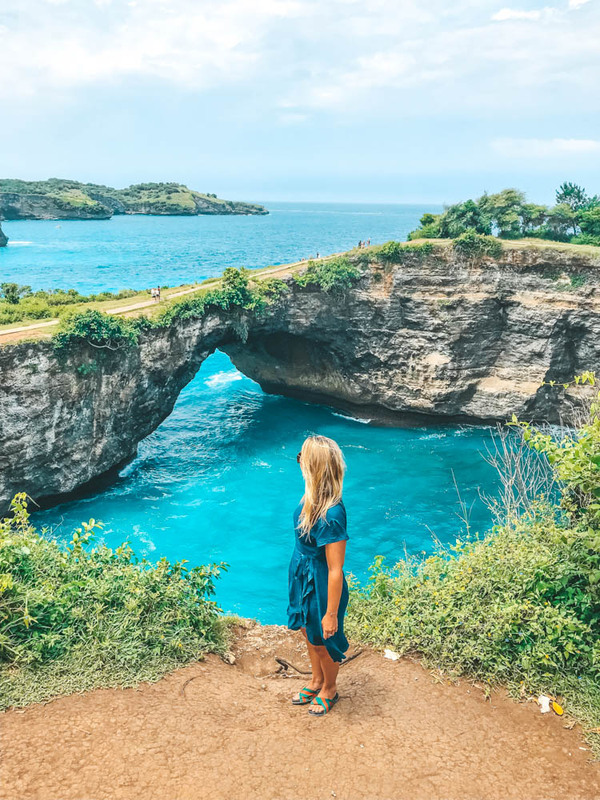 Unfortunately, it was high tide when I was here so no one was swimming at the time but I still think Angel’s Billabong is a nice place and a must to go to when you are at Nusa Penida. 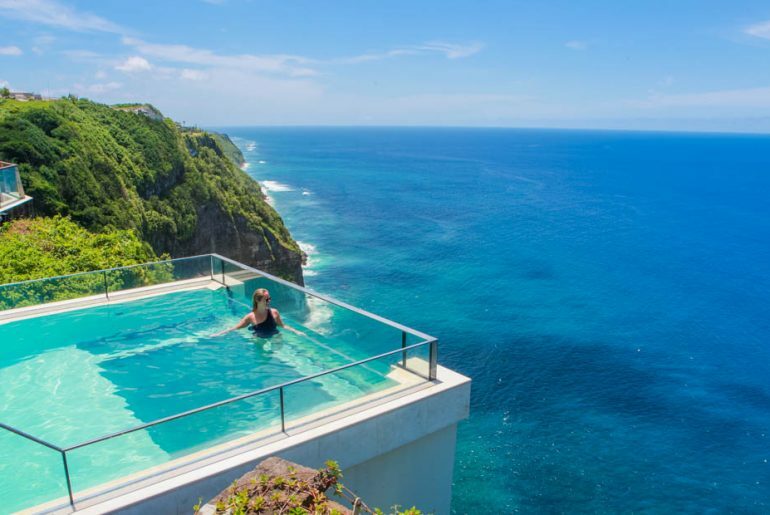 You can say that this is a natural infinity pool that blends into the sea. 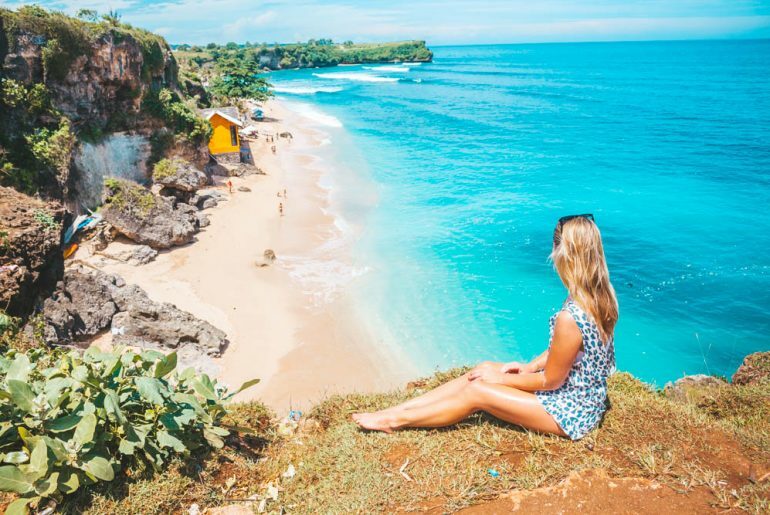 Another great spot on Nusa Penida is Broken Beach which is just around the corner from Angel’s Billabong. It is walking distance between these places so they are really close together. 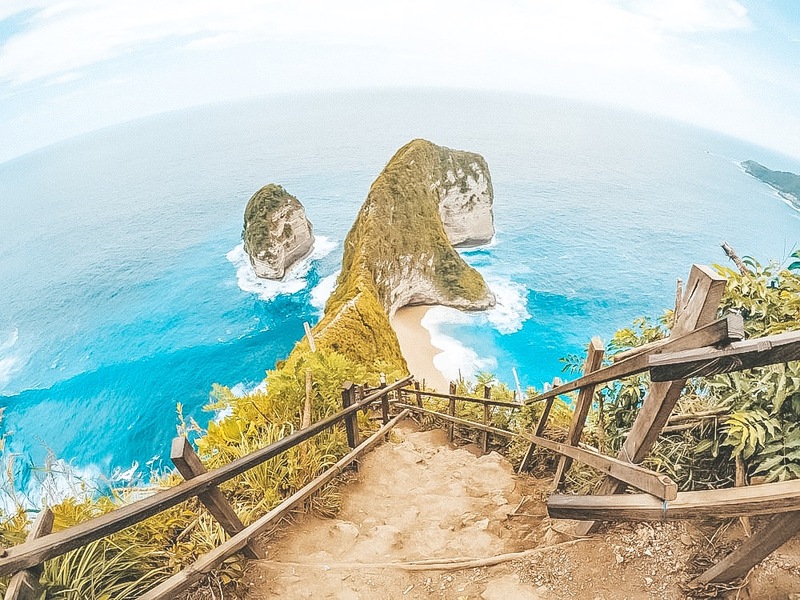 From here you get a wow experience over Broken beach! 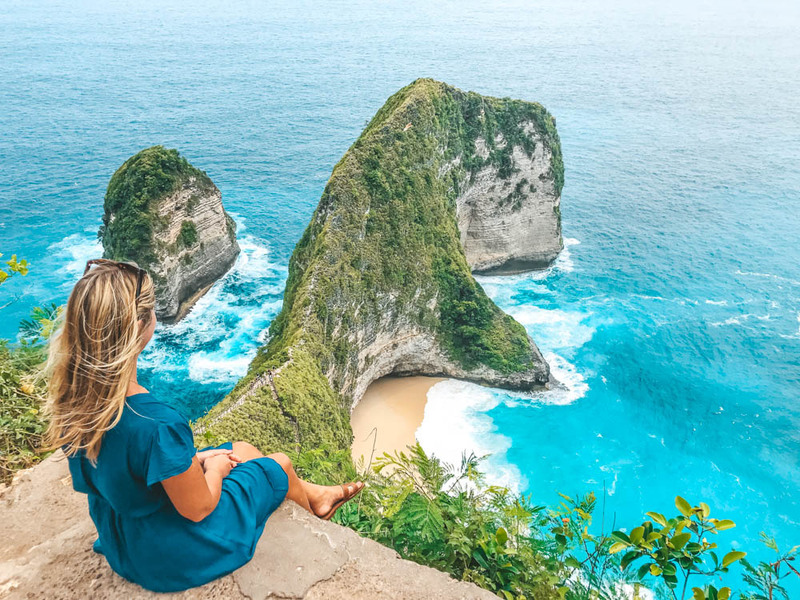 Unfortunately, I didn’t go to Crystal Bay but it is said that this is Nusa Penida’s most beautiful beach as it is incredibly beautiful. 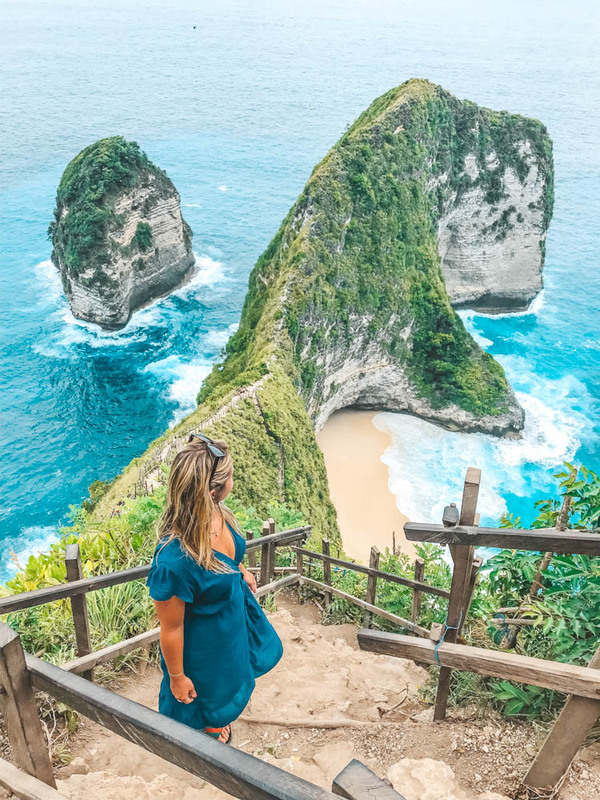 For my part it will be a visit to Crystal Bay beach next time I’m coming to Nusa Penida but if you have time then this beach is worth a visit! 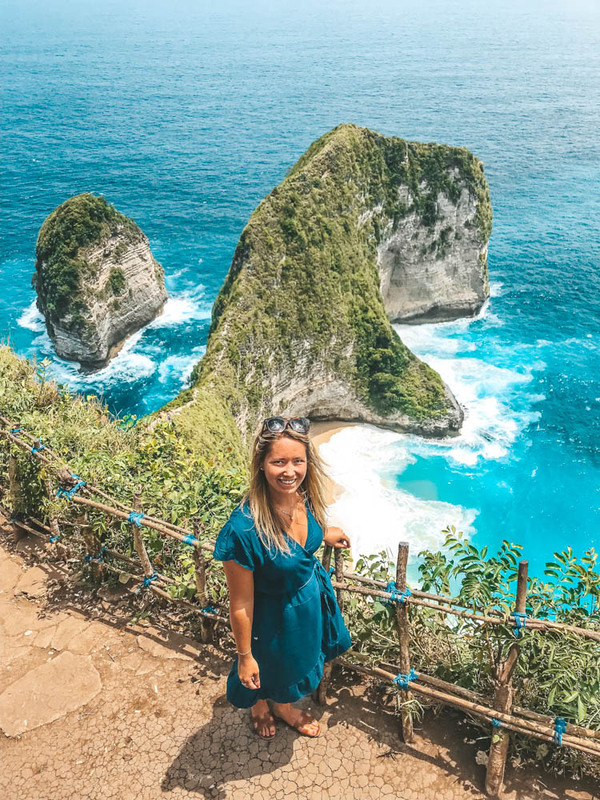 In all three places I went to on Nusa Penida there were a lot of tourists! In one place at Kelingking beach it is even queue to sit down on a stone and be photographed (this one below). So my recommendation is to come here in the morning, to avoid queuing and tourists if you have the opportunity. 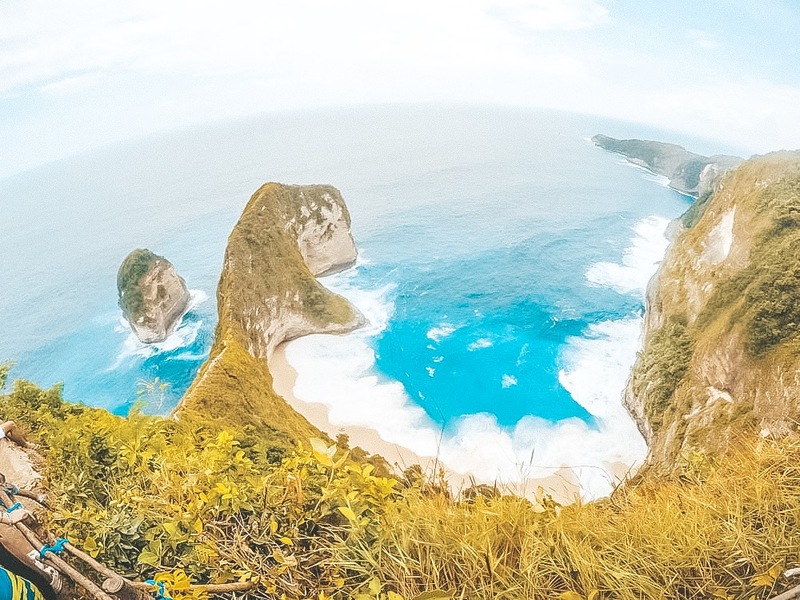 Nusa Penida is a gigantic island and I’m glad I didn’t stay here, just went for a day trip, it suited me better. 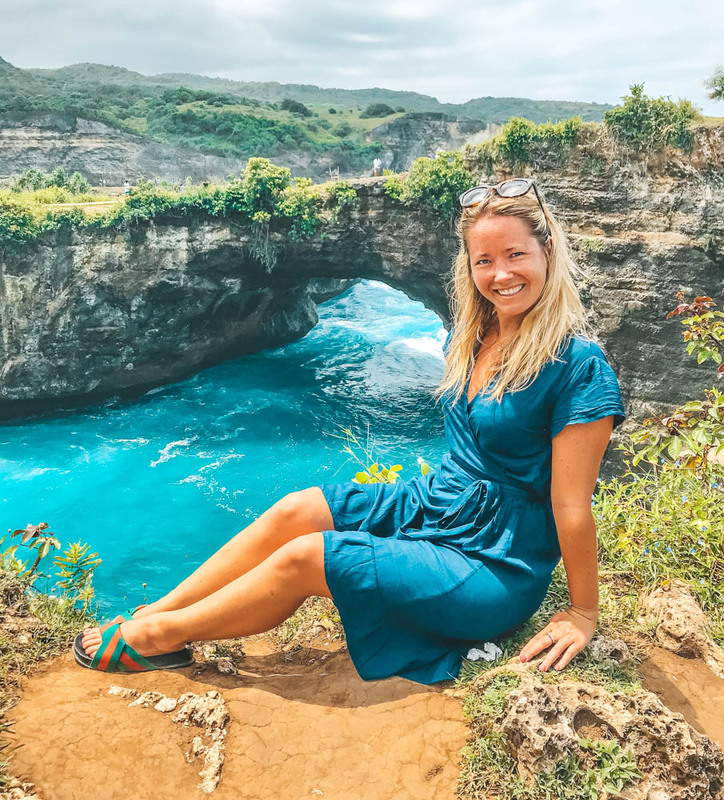 You can read more about my travel tips to Nusa Lembongan in this blog post. Nusa Lembongan was more manageable for me and just in size to get around with a scooter by myself. 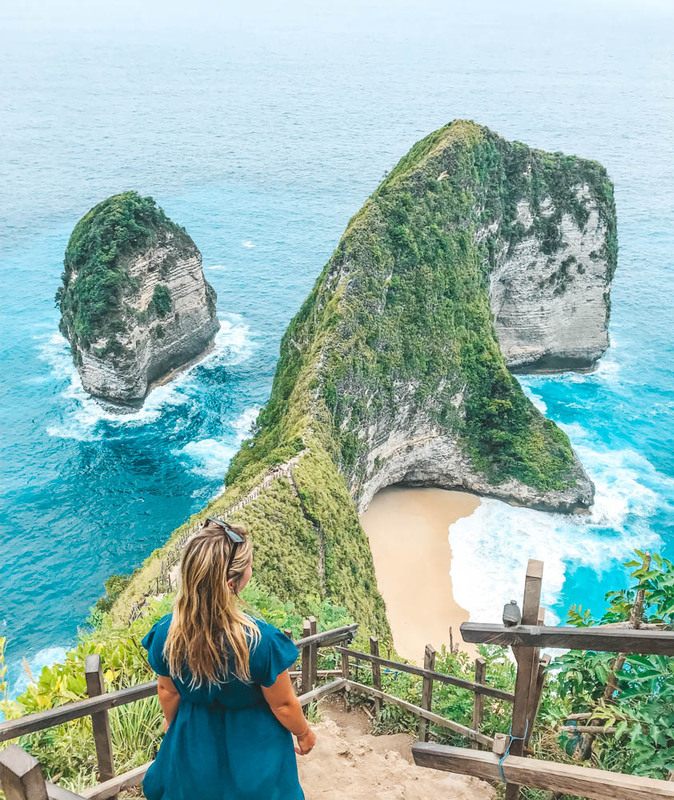 Nusa Penida has lots of greenery, jungle and you go up and down between mountains to get around. 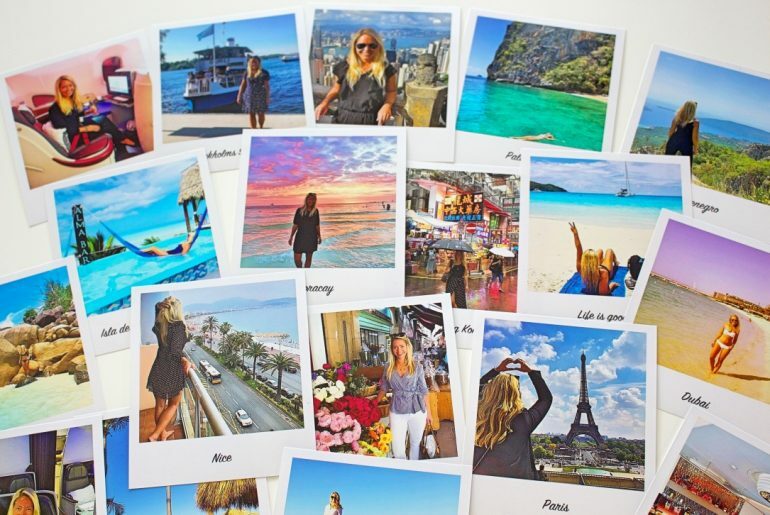 I saw girls traveling solo who went on a scooter or had rented a scooter with a driver, which is so fun to see that other girls dare to travel solo as I’m doing! 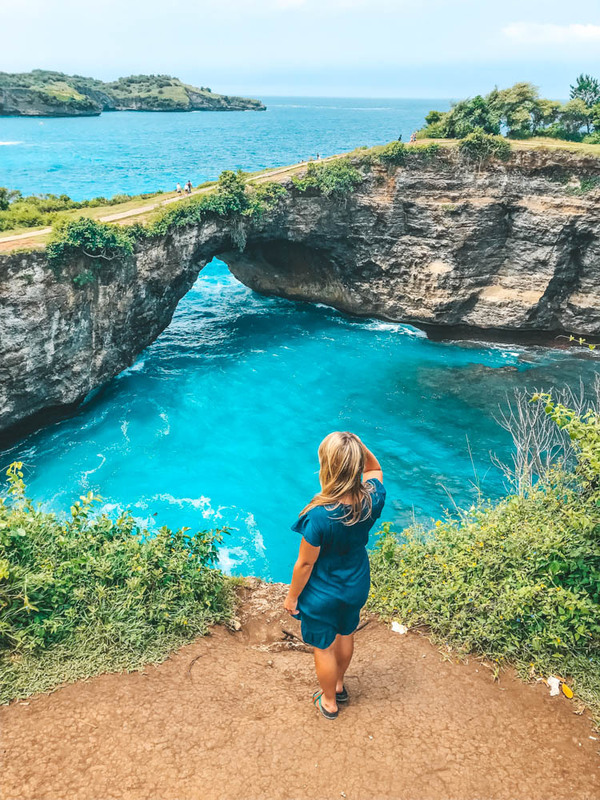 The road surface on Nusa Penida is not good, not at all, which can be good to know if you want to go here and rent a scooter to drive around on the island. 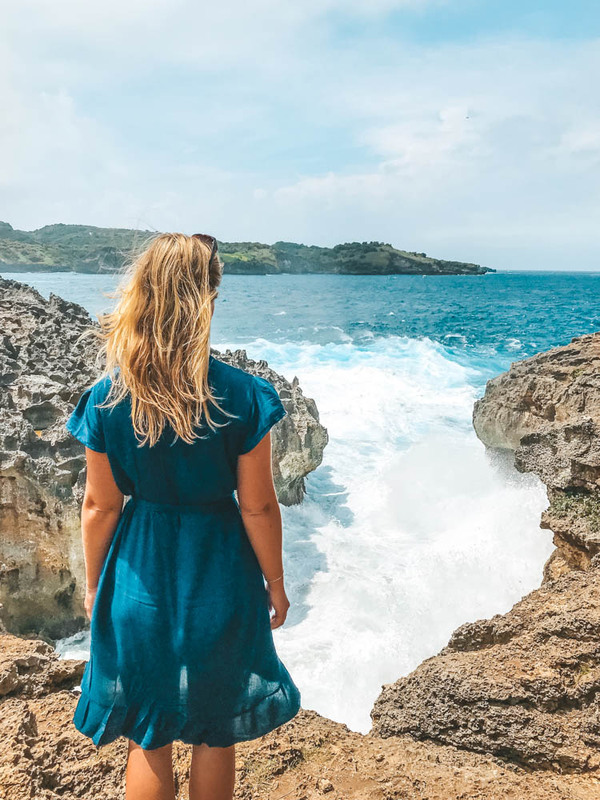 It is a gigantic island and you will need to drive for a long time to get where you want, no matter where you want to go. 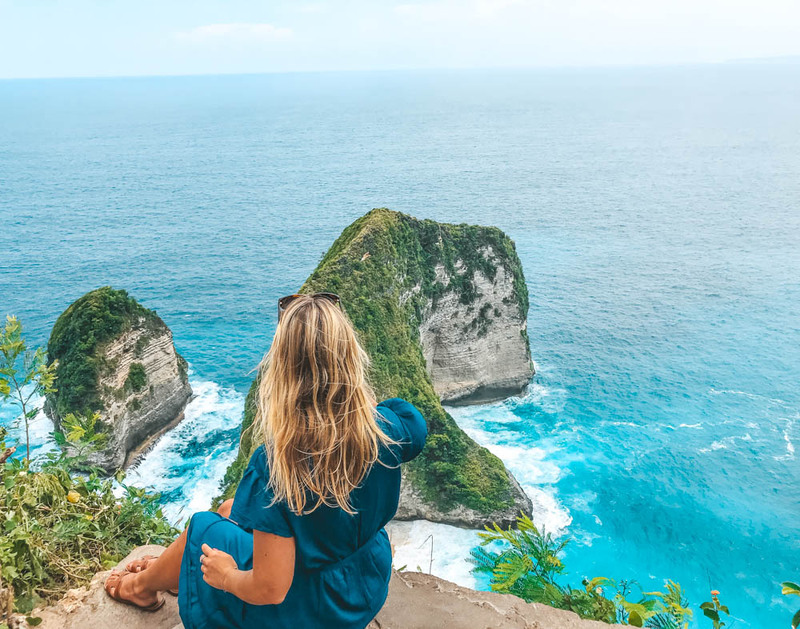 Sometimes there are a little paved roads but far from everywhere so expect that it will be very bumpy when you driving around but it is still really worth visiting Nusa Penida! 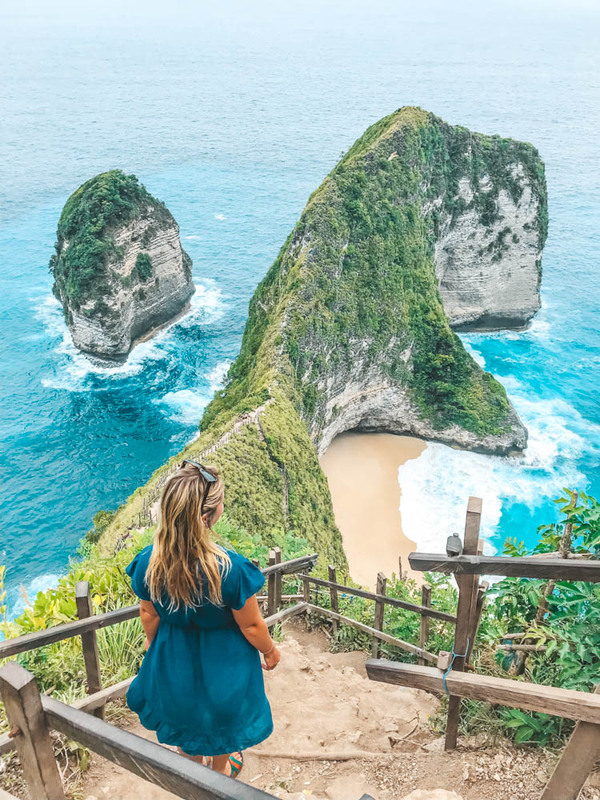 Have you been to the island of Nusa Penida, what did you like most?